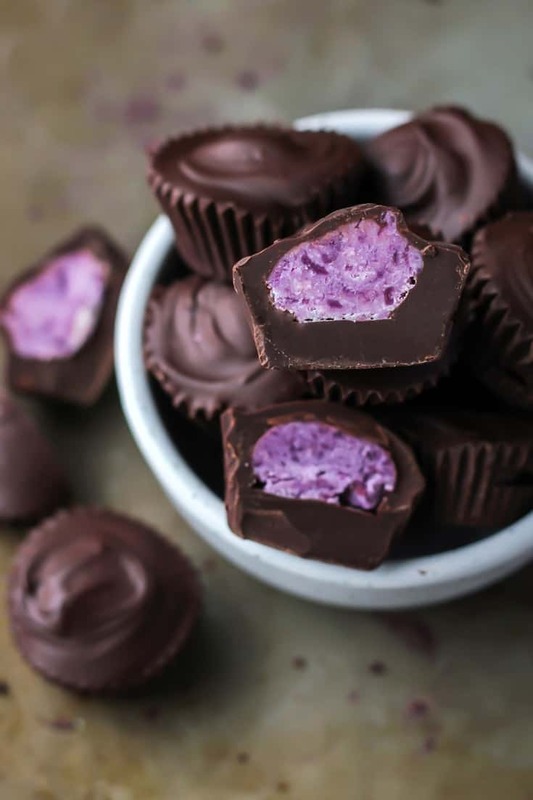 Purple Potato Coconut Butter Cups! 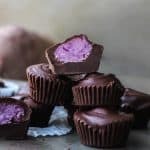 These homemade cups use beautiful purple sweet potatoes for a fun, colorful center anyone will love. They’re super easy to make, vegan, gluten-free and paleo. Ummm, I just put purple potato in my coconut butter cups… Did I just do a really weird, unforgivable thing? Can we still be friends? Please say yes. I promise they’re amazing. During my Whole30 I probably ate a sweet potato (yam) every day for the first two weeks. And while I never really tired of them (evidence here, and also here) I just felt like maybe I could start adding other types of potatoes into my diet. Prior to starting my Whole30, I didn’t buy purple potatoes that often. I do most of my shopping at Meijer and I can’t recall ever finding purple potatoes there… And while have purchased purple potatoes at our Whole Foods, I *try* not to shop there too often because sometimes I have a hard time controlling my impulse purchases and find myself wandering the aisles a little too much… Anyone else struggle with this? When I was up at Trader Joe’s the other week, one of the first things I spotted was this giant bag of purple potatoes. I got so excited because finally I could get a giant bag and not just a few (pricey) potatoes at time from Whole Foods. So, naturally they found their way into my basket. And then I realized a cart would have been the smarter option at TJs. But I tell you what, grabbing a basket instead of a cart does wonders for those arm muscles… Well and the wallet, usually. Anyways, I wish I would have bought a couple more bags of purple potatoes because they’re definitely my new favorite. And now that I’ve decided to stuff them inside of coconut butter cups, I DEFINITELY need many, many more bags or purple potatoes. I want to make these cups for everyone!! 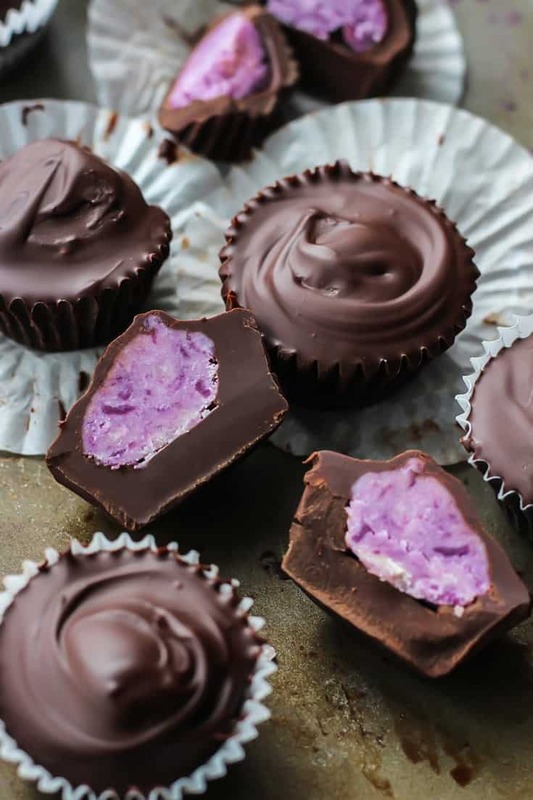 They’re kind of like my Dark Chocolate Matcha Coconut Butter Cups but basically we’re just replacing the matcha coconut butter filling with mashed purple potato combined with coconut butter. It’s pretty freaking awesome. To prepare the purple potato you can either bake it in the oven for about 45 minutes to one hour at 375F, or boil it in a pot of water for about 30 minutes, until soft. Then remove the skin and mash it with a fork. 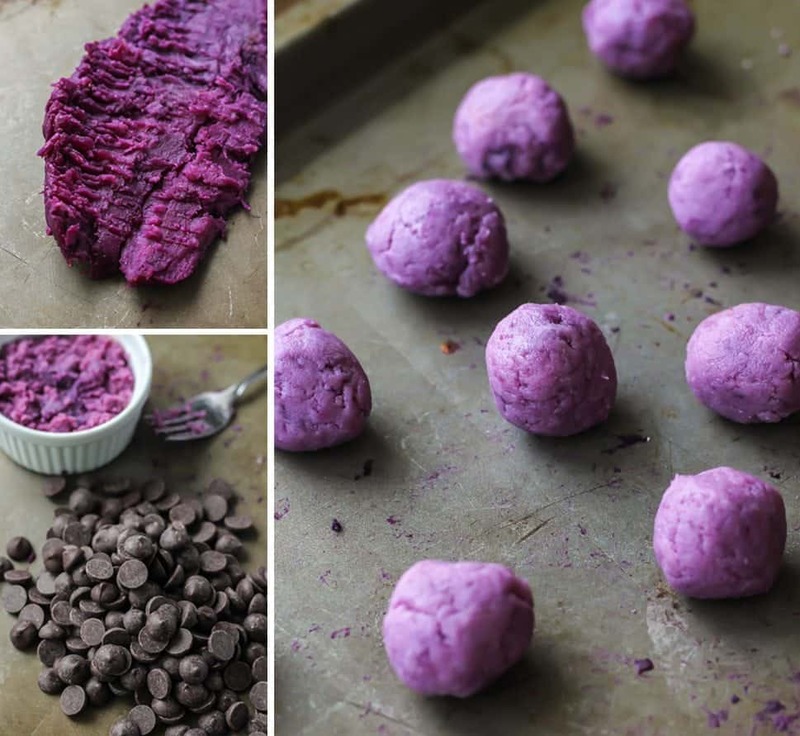 Next it’s just combining the mashed purple potato with the coconut butter, and rolling the mixture into teaspoon size balls to place into the chocolate layer. Cover with more chocolate, set, EAT. But truly how fun are these?! The insides are PURPLE. I gave one to Drew and as he bit into it I made him guess what made the filling purple… but he didn’t humor me. So I shouted “PURPLE POTATOES.” Then he basically asked why I would do such a thing and proceeded to look at me like I was crazy. Story of my life, right? Line mini muffin pan with 12 paper liners, set aside. 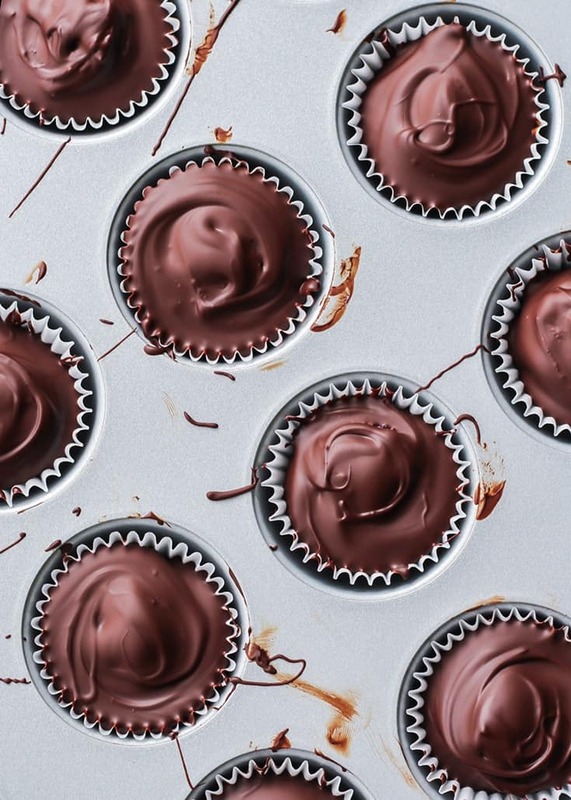 Scoop just a little less than ½ tablespoon of melted chocolate into 12 muffin liners. Transfer pan to freezer and allow chocolate to set for 5 minutes. While bottom chocolate layer sets, make your filling: In a small bowl, microwave coconut butter with mashed purple sweet potato Set aside. Take muffin pan out of freezer. Using ½ teaspoon, scoop a rounded ball of sweet potato coconut butter (equal to about 1 tsp) and place on solid chocolate. Gently press butter down a little bit with back of teaspoon to flatten. Cover in more melted chocolate, about another ½ tablespoon. Transfer pan back to freezer for another 5 minutes until set. I like to store my chocolate cups in the fridge, then allow to come to room temperature before eating. Enjoy! *It’s really easy to make your own coconut butter! Just follow this tutorial from my friend, Les. -To prepare purple sweet potato you can boil a small potato in pot covered with water, for about 30 minutes, or until soft. Alternatively you can also bake the potato in the oven at 400F, about 45 minutes to 1 hour, depending on size of potato. Have you tried purple potatoes yet? What’s your favorite way to enjoy potatoes (any kind!)? Totally in love with this idea! I have not yet found purple potatoes when I have been out grocery shopping, but have not looked real hard at TJ’s so I am going to have to find them next time I am there. I just love the color of these cups with the purple inside! Ah I hope you find the purple potatoes! They’re just too good. OMG THESE ARE AMAZING! So creative! They’re SO pretty; I love how you used purple potatoes. That was so genius. These are amazing Ashley!! I just picked up some purple sweet potatoes from TJ’s too, so these are going down in my kitchen! Heck yes! 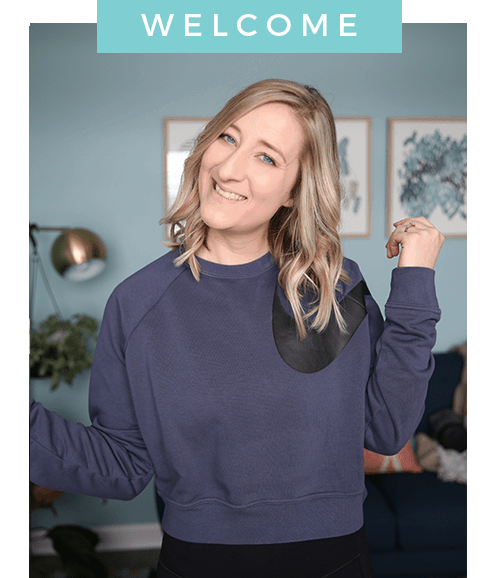 Thanks so much Ellie–hope you guys enjoy! These are gorgeous and so creative! Love! I can’t even with these. I’m literally so impressed w your brain. Bring some to Chicago. I’m dying over how AMAZING and creative these look! Literally art. You slay me every time. And I’m so glad the coconut butter tutorial is coming in handy. I love purple, I love potatoes, & I love dark chocolate…I’m curious to know what these taste like. How would you describe it? I’m gonna have to find some purple potatoes so I can try these! 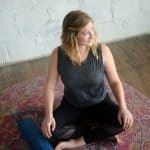 Can you substitute a nut butter for the coconut butter? Hi Carmen, Yes! You can substitute another nut butter 🙂 The color may change a little bit but other than that it would be fine. Hope you enjoy!